The versatile roaster is best suited for roasting large cuts of meat or whole poultry and cleans easily thanks to its nonstick coating. The tall, straight sides are ideal for preventing spills, or splattering and the large, signature handles make for safe and convenient movement in and out of the oven. 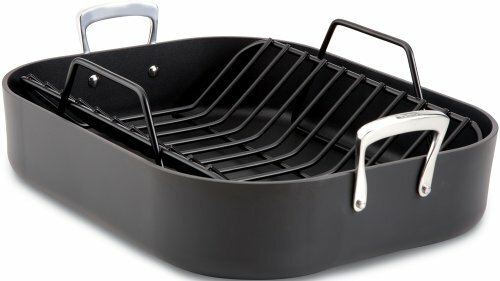 The nonstick v-shaped rack allows for even browning of meat and collection of natural juices in the pan for basting, glazing or a gravy base.